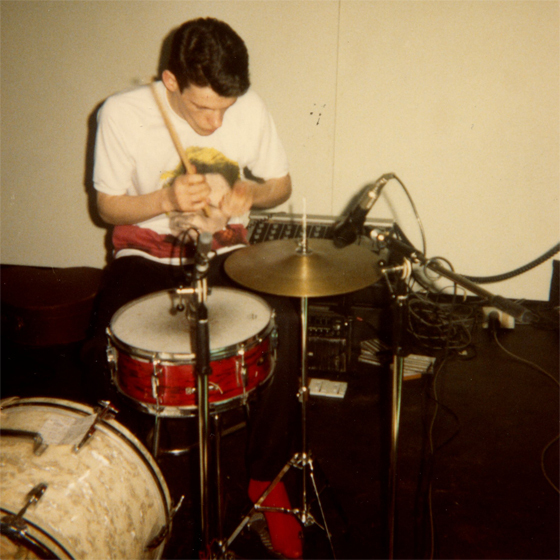 Formula Disco was a live → ↑ → project, developed as an extension of the record/phonographic project of Asphixiation. 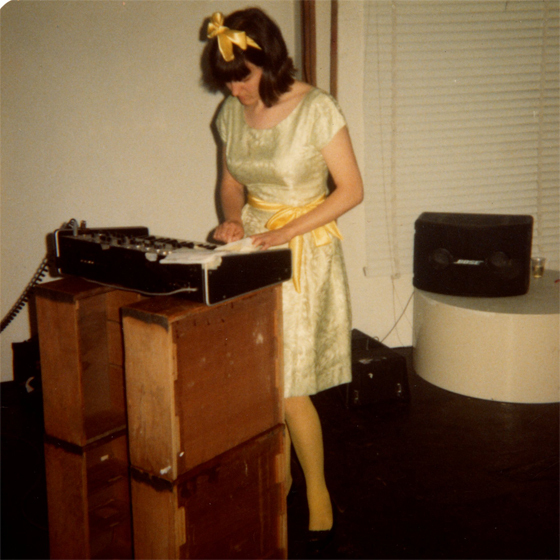 Both explore the phenomenon of the ubiquity of Disco at the time. 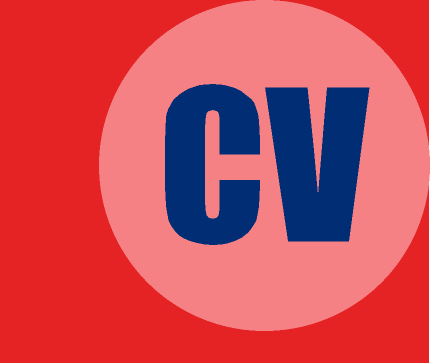 Formula Disco is a theoretical extension from ideas worked on for the Asphixiation project. 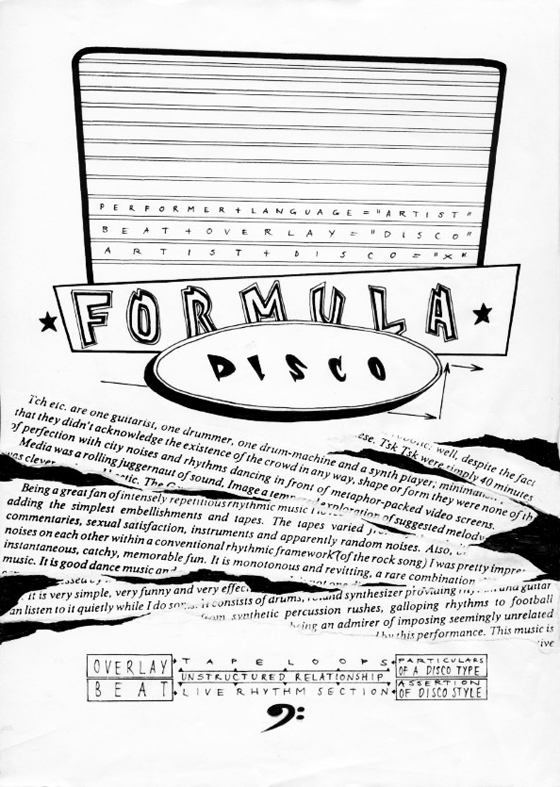 Whereas Asphixiation dealt with the writing of a Disco music based on stylistic quoting and a self-effacing representation (songs that sound "no different" from real Disco songs), Formula Disco deals with a clinical dissection of the base framework that qualifies Disco music as a type. 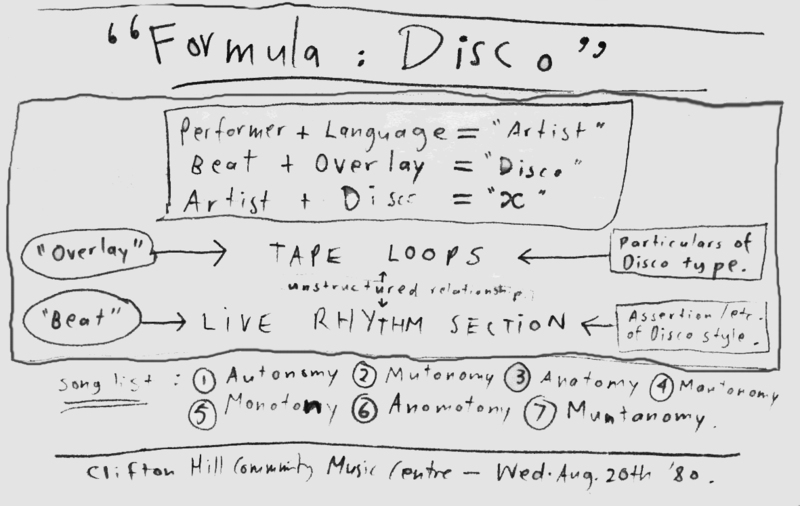 In this light, we present the following formula designed to solve the initial problem of "how does one construct Disco music?" 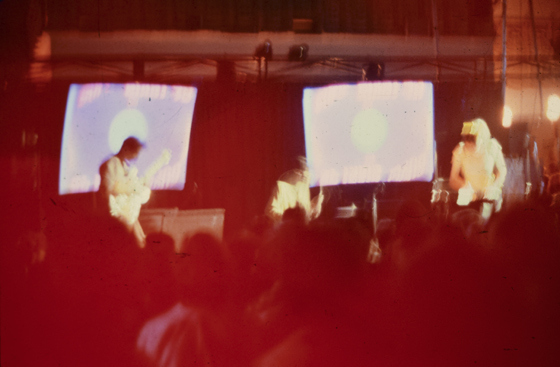 The key infuences for Formula Disco were studio bands/artists who developed a strict, metronomic, almost-Neanderthal approach to composing and producing Disco music (eg. Lipps Inc, Lime, Munich Machine, Indeep, MFSB, Rose Royce, Kryptonite, Bionic Boogie, Pink Project, Space, etc.). For → ↑ →, Disco and post-punk were indefinably fused: both prioritized sonic sensation, struck anti-musician stances, were brutish with their lavish minimalism,and viewed the studio as a clinical laboratory of creation. Their studiophonic worlds afforded a porthole to ulterior spaces where artifice and a reduction of emotive expressionism were welcomed. 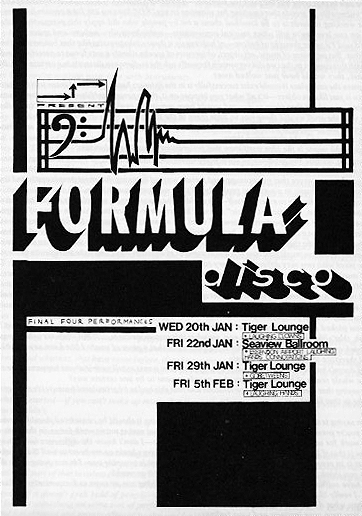 Formula Disco took this to an extreme, by advocating a celebration of Disco at its most formulaic. 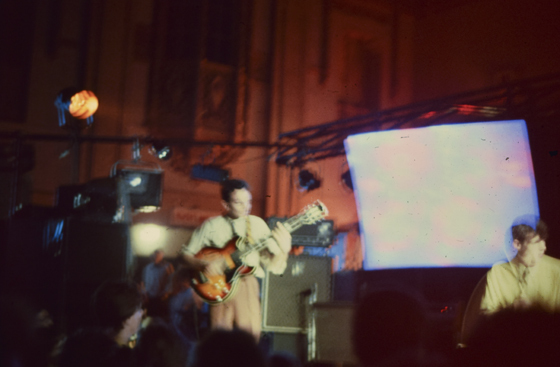 As per the theoretical chart of production which accompanied the premiere of the project in 1980, Formula Disco was based around a live trio (drums, guitar, bass synth) which performed repetitive blocks of blunt Discofied patterns while a set of sounds or tones played on an endless cassette loop (a new release by TDK at the time). Philip would insert a cassette into the deck, press play, then count in the trio. Each track followed this procedure strictly, with tracks lasting around 5 minutes. 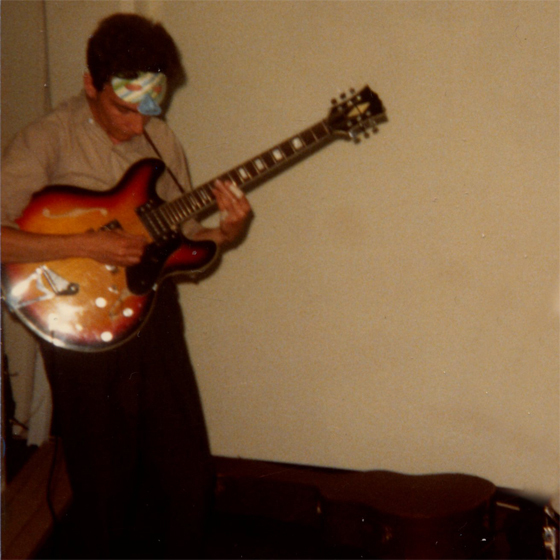 The guitar was light, crispy, and flanged; the drum kit consisted only of a kick, snare and hi-hat; and the bass synth played a basic patch with resonant expression on the attack and sustain. 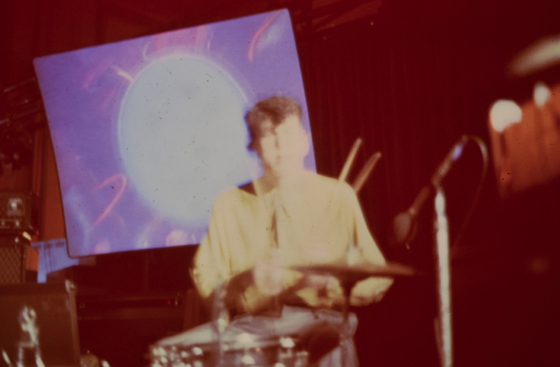 For some concerts in Sydney in 1982, videos accompanied the performance: two separate screens projected close-up images of Philip's large collection of generic 12" disco covers. The vacant cut-out centre of the covers occupied the centre of the screen; the edits accentuated the various Disco stylistic graphics adorning the various covers. It was a succinct summary of the semiotic aspect of sound forged in Formula Disco. 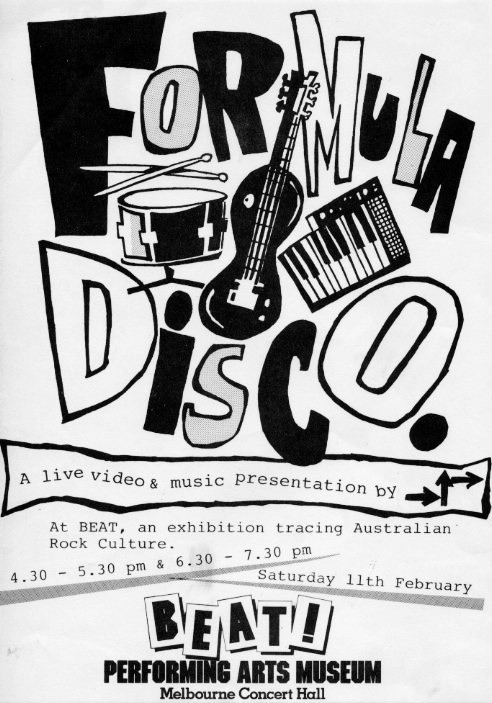 No studio recordings were made of Formula Disco. 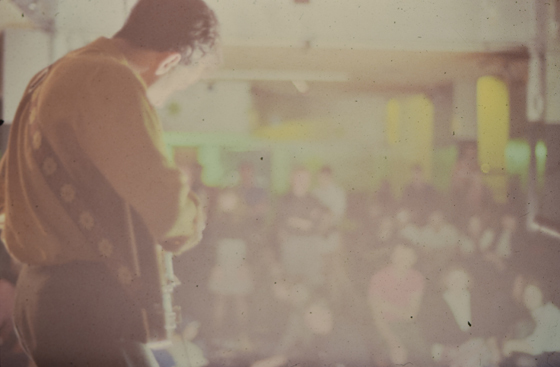 A few live recordings somehow materialized.